Posted in Parenting	by Kendra G.
June is Potty Training Awareness Month, so I thought I’d throw it back to a post I wrote about over three years ago that was originally posted on Orlando Moms Blog. I cannot begin to tell you how many times the words “pee pee” and “poopy” have come out of my mouth in the last two months. They are now common words in our vocabulary and here’s how we got there. We were anticipating holiday break from school for a number of reasons. Obviously, to celebrate the holidays and spend time with family, but also because of this looming reality that it was time to begin potty training our 26 month old. My husband and I were more than ready, having just had our second child two months prior. We were OVER the double diaper duty. It was time. 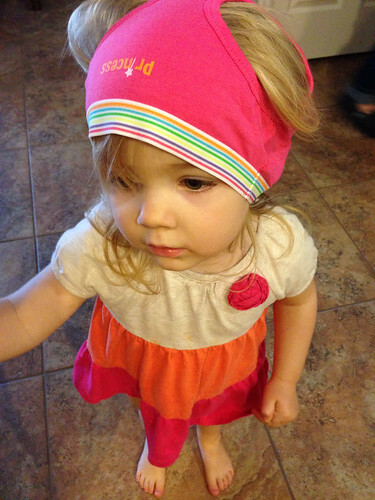 We decided to try the 3 Day Potty Training method after several recommendations from others. Buy the flushable wipes. These would have come in handy with all of the poopy accidents we had. We use them now and they are so much better than the dry toilet paper on their little bums. Get in the mindset of two steps forward, one step back. Potty training is a process, and as long as you’re moving forward, keep going! Celebrate the victories, big or small, and brush off the accidents. Just keep moving forward. Stay positive. This is probably a no-brainer, but believe me, it is so incredibly hard, yet so incredibly important. Take a step back, a breather, have a drink, do whatever you need to do, but stay positive! Listen to the poop song. This was something else I had read about online — and my daughter loved it! We frequently did a potty dance when she was done. Make the incentives visible. For each pee pee in the potty, my daughter got a “special treat” — an M&M. The M&Ms were in a dish on the counter, so she knew what she was getting. Each day we talked about getting a lollipop (or “pollipop” to her) if she poopied in the potty. But it wasn’t until she was doing the “I gotta go” dance on day eight when I rushed and grabbed a handful of Dum Dums from the drawer. I asked if she wanted a lollipop and she rushed straight to the potty to do her business. By golly, as soon as she saw the reward, she wanted it. Now, if only we would have started that on day one! Get a travel potty seat. This may have been more for me. I am now infinitely more aware of how disgusting public restrooms are. Having the folding travel seat helps me feel a little bit better about having to go into every public restroom we come across in the city. It may not happen in three days. I was so discouraged by the end of day three when we still had not had a successful poopy in the potty. I took “3 day” too literally. She picked up the peeing very quickly, but we could not get over the fear of pooping in the potty. Fast forward five more days and we made it! Day eight was the first day I felt she “got it” — and we were completely accident free! Looking back, the fact that it only took us eight days to potty train is pretty amazing, but it was very hard to see while we were in the moment. Give the night-time a try. If you’re considering doing “3 Day Potty Training” (or 3+ days as I mentioned above), then you should consider going all in. We got a lot of funny looks when we said we were going to potty train day and night at the same time. Ironically enough, the night time clicked faster than the pooping did. I was just as shocked as you probably are reading this. If the night-time doesn’t work, no harm in trying — you probably just did a few extra loads of laundry more than you normally would have. Every child is different. I know, I know, this is obvious, but we moms know how easy it is to get trapped in the world of comparing our child to someone else’s. We’ve all done it. Just try to make a conscious effort not to do it when it comes to potty training. While I would consider our potty training experience a success, I will tell you it was not easy, nor fun. It’s safe to say that it was toughest parenting hurdle we’ve had to jump to date. But it was so worth it! So tell me, what are your successes and challenges when it comes to the “pee pee” and the “poopy”?